“Excommunication” is a scary-sounding word. For many, it brings to mind uncomfortable concepts like failure, punishment, ostracizing, shame, and perhaps even evil—like those who are excommunicated are the lowest of the low. Perhaps it’s because of our natural drive to be accepted in our communities or the idea that the Church teaches that it has the means to salvation and exaltation but refuses to grant those blessings to certain people. In any case, excommunication is often regarded as the ultimate dishonor that can be designated to a former member of the Church. Of course, if The Church of Jesus Christ of Latter-day Saints is correct in claiming that it has the fullest, truest gospel available on Earth, excommunication is deeply saddening because it bars people from receiving eternal blessings that cannot be found anywhere else. However, we don’t have to think of it as a black mark, but rather an opportunity to repent or begin anew. Bride and Groom. A depiction of a New Testament–era bride and groom, by Lyle Beddes. Courtesy of the LDS Media Library. 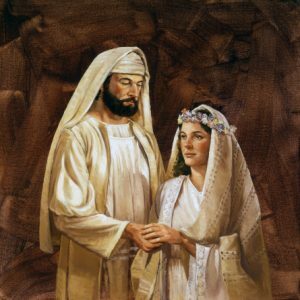 Throughout the scriptures, the Lord has likened His relationship with the Church to a marriage. Hence, we can consider our personal baptismal and temple covenants to be similar to a marriage relationship with the Church. All marriages have their unique problems, but when both parties work to overcome them and progress together, the relationship can be valid, rewarding, and mutually beneficial. 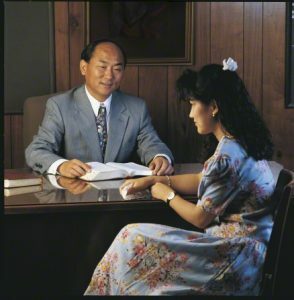 Similarly, Latter-day Saints may make mistakes and endure challenges but still be considered to have good standing with the Church, and the Church can also correct its errors and adapt to the needs of its members without losing the integrity of its core doctrine or its status as the true kingdom of God. However, just as with earthly marriages, there are times when it’s better to be “separated” or “divorced” from the Church. People who are guilty of serious sins that cause significant physical, emotional, and/or spiritual harm to others and are unrepentant prove that they cannot be trusted with covenants that demand better of them. Also, those who make it clear that they intend to commit to making choices that violate the core teachings of the Church demonstrate incompatibility with its mission. In these cases, excommunication is prudent because it nullifies the responsibilities that the member is expected to fulfill, just as divorce negates marriage vows so that the individuals may take their lives in new directions without being obligated to each other. Basically, it’s better for a person who will not honor their most sacred covenants to end the relationship rather than continue to be morally bound to it despite not intending to honor the stipulations on which it was founded. If you’re in a marriage and will no longer keep the promises that you made to your spouse, it’s best to cut ties rather than cheat or continue abusing the bond. For the same reason, if you’re a member of the Church but consciously, willingly, and egregiously disregard its core doctrine without any remorse or intention of changing, excommunication provides a means for you and the Church to go your separate ways without the greater condemnation being laid upon you. The Bishop. Courtesy of the LDS Media Library. Excommunication is always followed by the hope that repentance will begin and that eventually the person excommunicated will be re-baptized. Church leaders work with those who are humble and repentant toward this end. There is no institutionalized “shunning” in Mormonism, as there is in some other Christian churches. Members are supposed to be nurturing aids in a return to full fellowship. In the Mormon Church, excommunications are private. If you have seen publicity about someone who has been excommunicated, it is because the person has made it public in an attempt to put the Church in a bad light. Excommunicated Mormons are welcome in all regular church meetings, although they cannot fill “callings,” take the sacrament, attend the temple, or pay tithing. Heavenly Father always wants His children to choose Him and His gospel above all else, but when it cannot or will not happen, He still provides an opportunity for us to make our choices freely. We also have the great benefit of knowing that there is always a road back to Him. 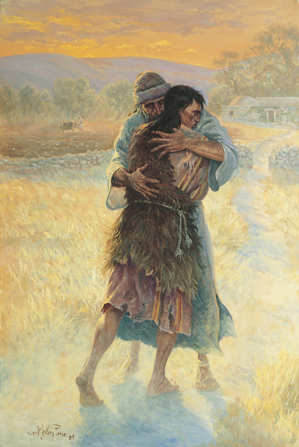 The Prodigal Son, by Clark Kelley Price. Courtesy of the LDS Media Library. Thank you for your time to write this article.